Preheat oven to 180°C / 356°F (fan oven to 160°C/320°F). Line a muffin baking tin with paper models. Peel and finely grate carrots. Separate egg yolks from egg whites. Whisk the yolks with sugar, lemon zest and the juice of a lemon until fluffy. In a separate bowl mix together almonds, flour, cornstarch, baking powder and spices. Add to the yolks and gently combine. Squeeze the water out of the grated carrots, and add carrots to the dough. Mix to combine. Whit a hand mixer or kitchen robot, whisk egg whites until fluffy and stiff, then with a spatula carefully fold them into the dough and combine. Add dough by the spoon into the muffin tin, filling it up to 3/4 with dough. Place in oven and bake for about 20 minutes, or until the cupcakes rise and turn golden brown. Check if they are done by inserting a toothpick into a cupcake. If it comes out clean, without wet dough sticking to it, your cupcakes are done. Remove from oven and set on a rack to cool down completely. Prepare the toppings and decoration: add a drop of vanilla extract to the soy whipping cream and whip according to package instructions (mine only needed 2 minutes). Put whip cream in a dressing bag and then dress the cupcakes with the whipped cream. 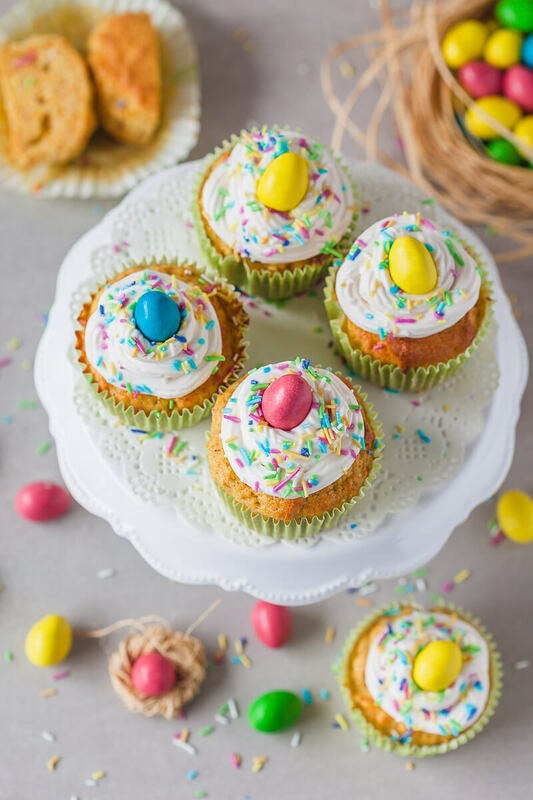 Sprinkle the cupcakes with rainbow sprinkles and add a small chocolate egg on top. Serve.